On 31 August 1670 the first feast of the Sacred Heart was celebrated in the Grand Seminary of Rennes . Coutances followed suit on 20 October. The feast soon spread to other dioceses and the devotion was adopted in various religious communities. In 1856 Pope Pius IX extended the feast to the universal Church under the rite of double major. In 1889 it was raised by the Church to the double rite of first class. On 11 June, 1899 by order of Leo XIII and with the formula prescribed by him, all mankind was solemnly consecrated to the Sacred Heart. The idea of this act, which Leo XIII called "the great act" of his pontificate, had been proposed to him by a religious of the Good Shepherd from Oporto (Portugal) who said that she had received it from Christ Himself. Most sweet Jesus, humbly kneeling at Thy feet, we renew the consecration of our family to Thy Divine Heart. Be Thou our King forever. In Thee we have full and entire confidence. May Thy spirit penetrate our thoughts, our desires, our words and our works. Bless our undertakings, share in our joys, in our trials and in our labours. Grant us to know Thee more, to serve Thee without faltering. By the Immaculate Heart of Mary, Queen of Peace, set up Thy kingdom in our country. so that no one cry may respond from home to home. May the triumphant Heart of Jesus be everywhere loved, blessed and glorified forever! Honour and glory to the Sacred Heart of Jesus and Mary. 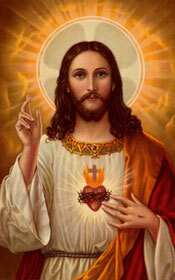 Sacred Heart of Jesus protect our families. Sacred Heart Catholic School was built in 1949. Subsequently, there have been several additions and upgrades to the facilities. The most recent major renovation occurred in 2003 when underground heat source and air conditioning was installed, as well as upgrades to the gymnasium, several classrooms and work and storage places. The Sacred Heart School Community is composed of residents in the Northwest corner of the City of Sarnia, as well as families from nearby Point Edward. The families have always been very supportive of the school, which currently has a school population of approximately 300 students. Sacred Heart School is a prominent educational institution in Sarnia, as it has established an excellent reputation for high academic standards and student accomplishments, is well known for its modern computer technology applications and possesses a strong special education program. Its successful sports programs have brought much notoriety to the school, as has its tremendous community support for charitable causes such as the Terry Fox Foundation. The school, of course, is closely affiliated with Sacred Heart Catholic Church, which resides on the neighbouring property immediately north of the school on Charlesworth and Lecaron Avenues. There is a strong sense of community and close bond between the parish and school which allows for and supports the mental, physical and spiritual growth of all community members.